The crystallizers of the FB series are based on the prin- ciple of the vibrating fluid bed. The material is transpor- ted on a perforated surface and held in suspension by an air flow and the vibrations of the surface. The system is suitable for the crystallization and drying of PET granules or flakes from the washing lines. The residence time is very small (less than 15’). The air heating can be done with electric heaters, natu- ral gas heaters, diathermal-oil or vapor heat exchanger. Equipped with am high-efficiency fan with variable flow. 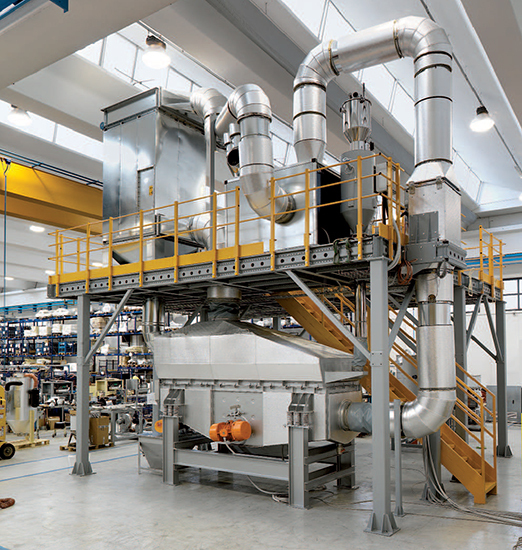 The partial recycling of the air used in the drying pro- cess for energy saving. The control with a Siemens PLC allows an easy opera- tion in every working phase. • Rotary valve for loading and unloading. • Pneumatic feeding and extraction system. • Oil condensation system. It dries and crystallizes the material in a short time with throughputs in 10'. Dedusting of paper material, PE and built-in self-cleaning dust filter. It increases the performance of the extrusion system. Low and easy maintenance, easy to clean.